What does the world look like through the lens of Russian TV? How is the news framed on the nationwide networks? Which emotions and attitudes are communicated by the hosts? 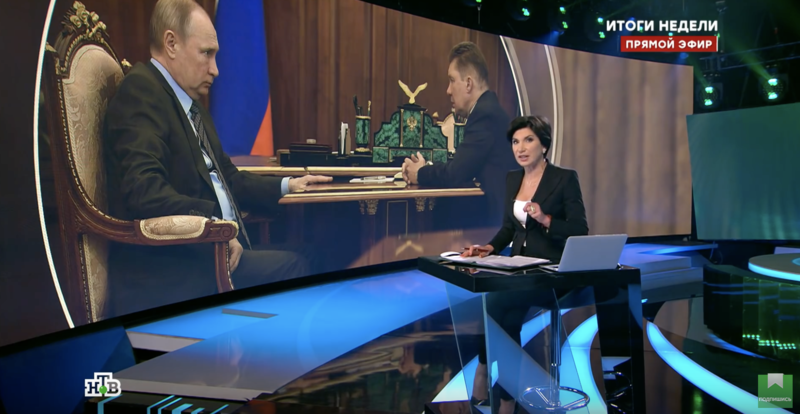 We looked for answers in a typical flagship programme, Itogi Nedeli (“The Outcome of the Week”), which was broadcast on 17 March 2019 on one of Russia’s largest TV channels, NTV. Here is what we found. NTV host Irada Zenaylova opens her Sunday night show with a fast-paced walk towards the camera. On her backdrop, there are videos showing the Christchurch terrorist’s recordings, followed by images from a commemoration of SS legionnaires in Riga and confrontations between police and “yellow vests” in Paris. 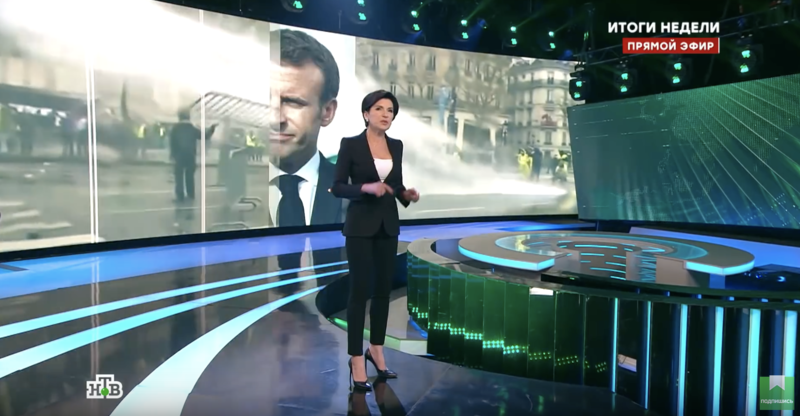 In the course of the rest of the programme, viewers are told about the recent terror attack in New Zealand, which NTV links to extremism throughout the West. 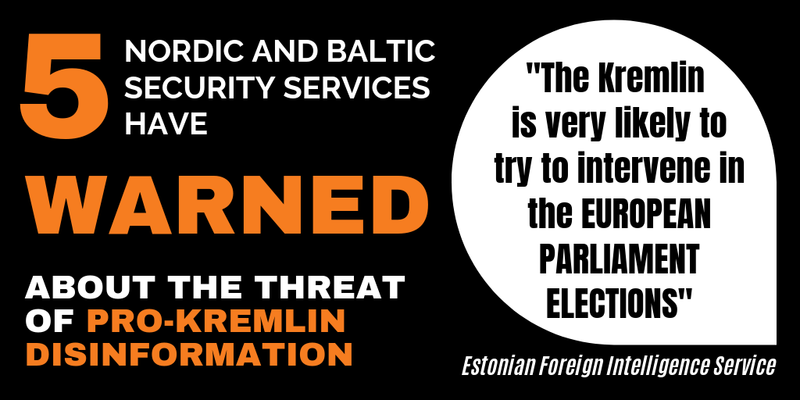 We hear about a remembrance rally for Latvian SS legionnaires held in Riga; about yellow vest riots in France; and about Brexit and the prospect of Scottish independence. 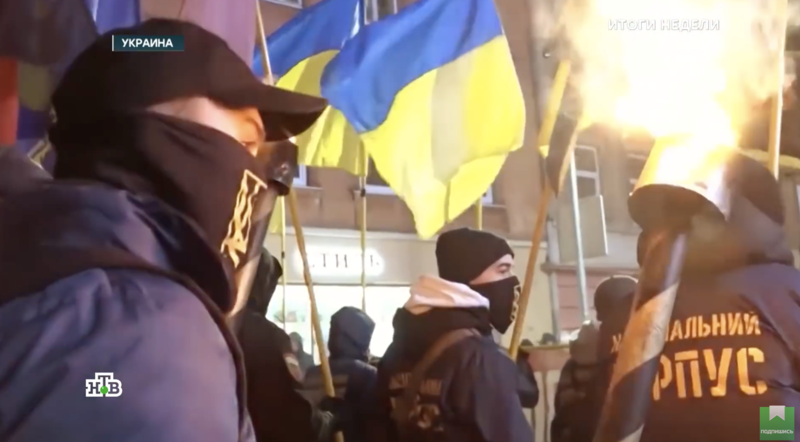 A long part of the programme is devoted to the upcoming elections in Ukraine, including a description of a possible post-election scenario in in which Ukrainian territory can be torn apart by neighbouring nations. We hear about the annexation of Crimea, including a reference to the claims about American plans to build a military base on the peninsula. Viewers are also told stories about cases of misconduct by US soldiers and other problems caused by the US army’s presence in different parts of the world. Then – and only then – after almost 45 minutes of international stories – does Russia begin to appear. First briefly, beginning with the message that even international observers acknowledge that “Russia is winning the sanctions war”. And at the very end Russia appears again in a story about the “Leaders of Russia” national programme for leadership talents. Then it concludes with a return to international news and the story of the young Swedish climate activist, Greta Thunberg, who apparently has a dream that she fights against evil, thus allowing our host to return to her opening remarks with another appeal not to allow “evil to enter” our houses: “We all have to live together, no matter which skin colour we have, or what the name of the God is which we believe,” she concludes. What can we conclude from this? Well, we have made the point before, but find it worth repeating: Russian television is not about Russia. 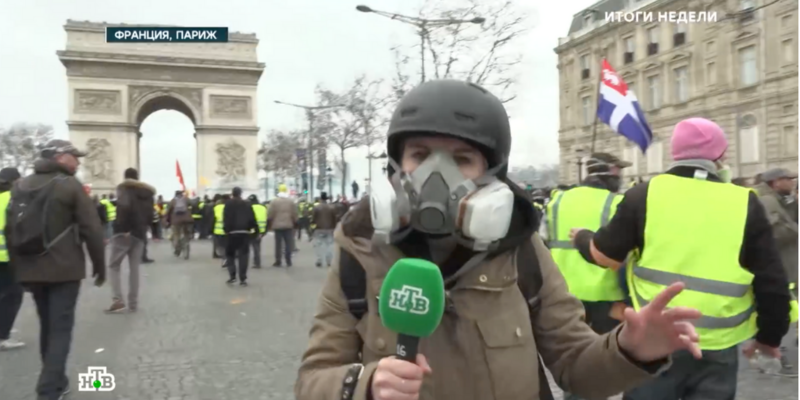 Across the dominating national TV channels, this typical Sunday night was filled with footage showing France, Germany, New Zealand, Israel, Latvia, Palestine, UK, Serbia, Ukraine and Venezuela. Many other countries also featured or were mentioned, among them Argentina, Austria, Bulgaria, Canada, Estonia, Hungary, Ireland, Poland, Sweden, Turkey and Yemen. 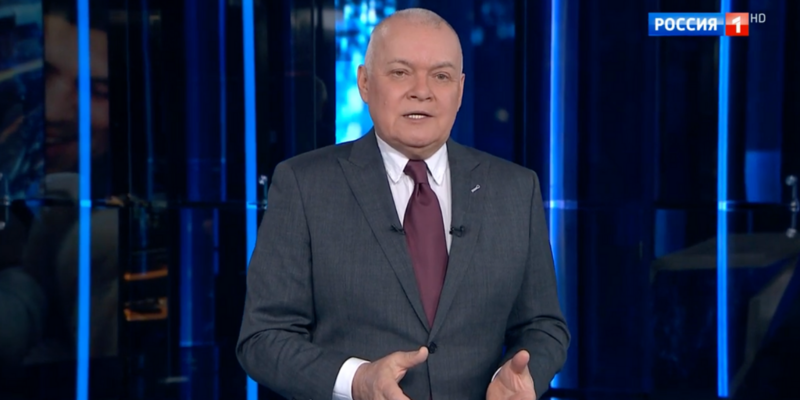 On the same Sunday night as NTV’s programme was broadcast, the EU-sanctioned propagandist Dmitry Kiselyov managed to tell three lies in less than three minutes on the state TV channel Rossiya 1. Out of eight hours of primetime national television on this Sunday night (see below), space was found for only a very small number of short items about Russia. Among them, the “Leaders of Russia” programme for young people was repeated on two channels. 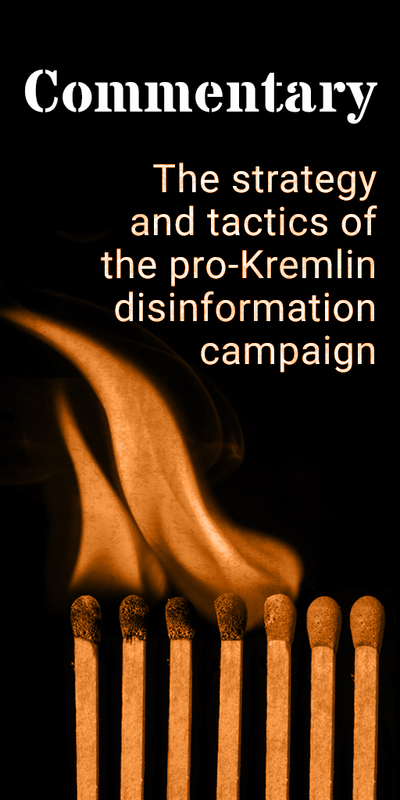 It is hard not to see in the high degree of overlap the influence of the Kremlin’s weekly guidelines to leading Russian media. Crimea also featured prominently in almost all flagship programmes during this Sunday. With coverage focused on the annexation, Crimea was used as an example of a Russian geopolitical triumph – more a topic of international relations than a domestic issue with its traditional focus on the social, economic and cultural life of citizens. 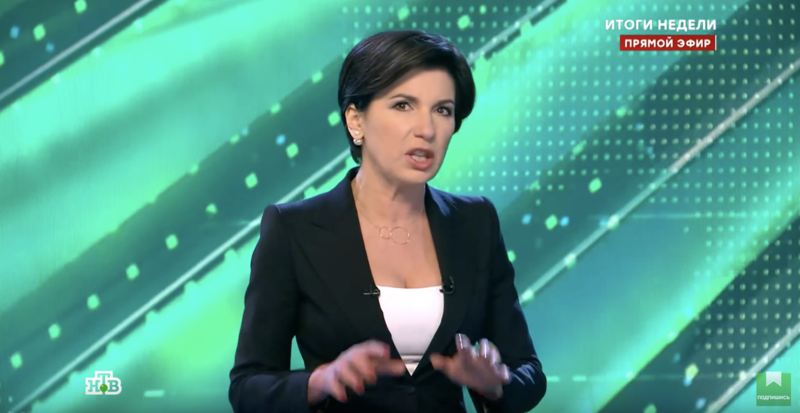 In Russian state-controlled media, geopolitics trumps national agendas; and NTV host Irada Zenaylova’s punchline in the opening of her programme – “What has happened to our neighbour may come to our house tomorrow” – sounds almost like an excuse of this approach. “The word ‘geopolitics’ means relieving a person from the obligation to decide about himself, to make an ethical choice. Geopolitics informs a person that all fundamental decisions have already been made for him – automatically, once and for all – by history, geography, and fate”.